 A reliable and easy to use product designed and perfected to maintain communication between a person in need of assistance and a service provider. 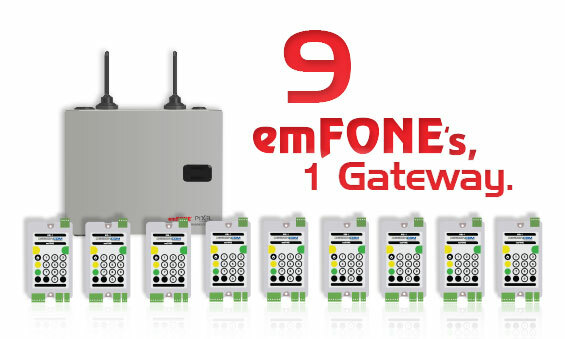 The EM-1 automatically dials and plays back a recorded message to a service provider alerting them to an emergency, which caters for impaired patrons that are unable to communicate. Built-in LED lights/relays also indicate when a call is being made and when it is answered. If the first programmed number doesn’t answer, another two numbers can be assigned to respond. The recorded voice message played upon answering a call identifies the calling location, which the service provider can playback at anytime using the touch-tone keypad on their handset. 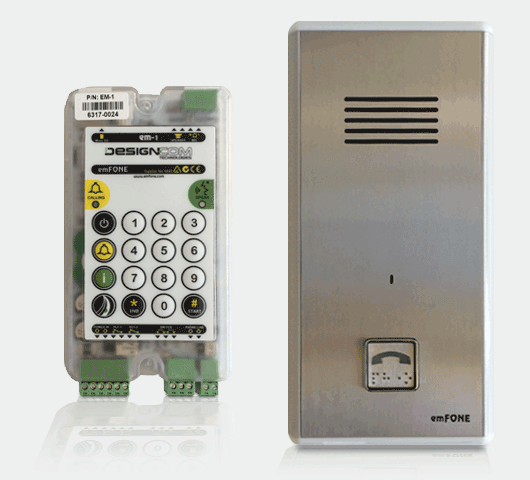 The unit has two on-board relay outputs that can be utilised for multiple functions. A lift breakdown signal can also be interfaced to the unit’s secondary alarm input. This allows for an automated call to be made to a programmed number alerting a service provider of a lift breakdown fault. The EM-2 is designed with fully programmable features to help a person unable to communicate with the service provider, either because of physical disability or language difference. Designed to help a person unable to communicate with the service provider, either because of physical disability or language difference, the EM-2 is a line powered auto dialing loudspeaker emergency point telephone with fully programmable features. 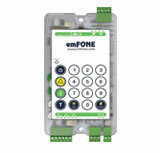 A remote programmable digital voice message of up to 16 seconds is played upon answer of the call. This is used to identify the calling location to the control center and can be played back at any time by pressing the correct sequence on the remote telephone keypad. Up to three telephone numbers can be programmed into the phones memory. Each number will be called sequentially until either the call is answered or all programmed numbers are exhausted. Two relay outputs are provided which can be used to illuminate buttons or indicators to alert the user that their call has been acknowledged and/or answered. The unit can be mounted into any setup with its internal or external speaker and microphone options. 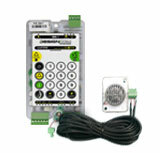 Once installed, programming is simple, with the option to use the on board keypad or to dial in remotely. No power supply is needed, as the unit is telephone line powered and can be connected directly to a PSTN line or PABX system. The EM-3 is designed with fully programmable features to help a person unable to communicate with the service provider, either because of physical disability or language difference. 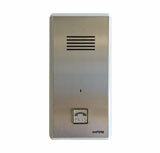 Designed to help a person unable to communicate with the service provider, either because of physical disability or language difference, the EM-3 is a line powered auto dialling loudspeaker emergency point telephone with fully programmable features. Up to three telephone numbers can be programmed into the phones memory. Each number will be called sequentially until either the call is answered or all programmed numbers are exhausted. 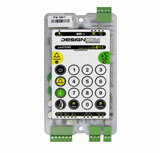 The DE-1 door entry button initiates a call to a programmed telephone number, the answering party can then remotely activate an internal relay to open a door or gate, switch on a light or camera. The DE-1 door entry telephone is complete with all essential functions and manufactured to be vandal and harsh weather resist. 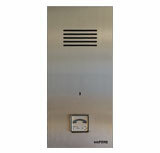 With a marine grade stainless steel panel in a powder coated aluminium surface mount enclosure. No separate power supply is required as the unit is telephone line powered and can be connected directly to a PSTN line or PABX system. Also capable of being remotely reprogrammed via a standard telephone as required by a single telephone call to site. Activating an internal relay can be programmed to react when the phone is answered or by entering a pin into the telephone keypad. An additional option is an automatic self check function where the telephone periodically reports its status to a central control centre. an analogue handset to be used as a telephone to pickup the handset and dial the number required.